Stylishly finished in Desert Silver Metallic, with a matching hard top and contrasting black soft top. The exterior paintwork is blemish free and highly polished on both the body and the top. Inward, the Saffron Leather interior blends nicely against the wood console and shows like new. The gauges and glass are all clean and clear, and all switches function as they should. This Mercedes comes loaded up with items like automatic climate control, cruise control, AM/FM Stereo with CD Changer, 10 Way Power Heated Seats, Tele Aid Emergency Calling, and Xenon headlights. Under the hood lay the venerable all aluminum 5.0L V8 that produces 302 horsepower and 339 foot pounds for torque. Driving this SL is simply a dream. It starts, stops, runs, and drives just as well as it did when it left the factory. Turn the key, drop the top, and watch the needle climb as you take off for that well deserved Sunday drive. A thorough TLD detail has just been performed to make sure that this car meets our strict standards. With low mileage and rare colors, this SL500 is as clean as they come. 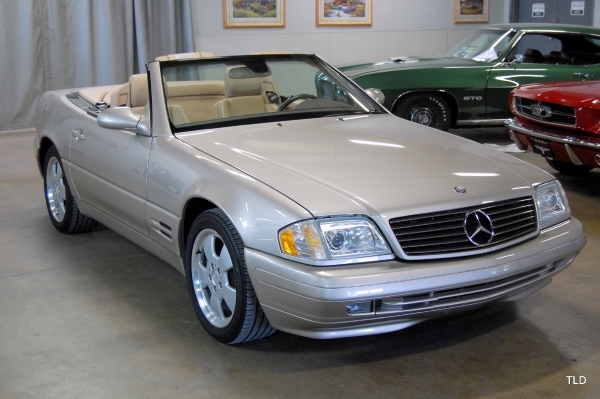 Stop by our showroom, drop the top and see how nice this SL really is, down to The Last Detail.